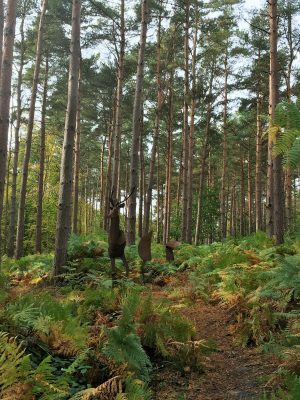 If you’re looking for a fun walk for young children in Hertfordshire, the Broxbourne Woods Sculpture Trail near Hertford takes some beating. The walk is suitable for buggies and wheelchairs and is a fairly flat one kilometre circular path. 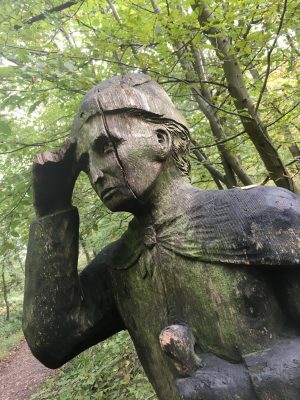 There are nine sculptures dotted along the trail, ranging from life size figures and woodland creatures to carved benches, perfect for enticing reluctant young walkers along the way. 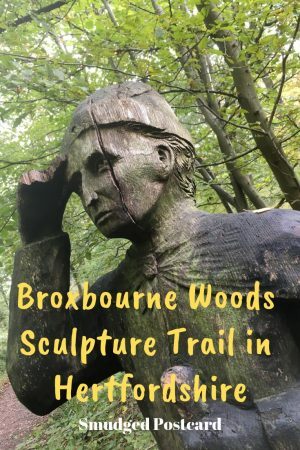 The Broxbourne Woods Sculpture Trail is shared with cyclists and horse riders and it is part of the much larger Broxbourne Woods National Nature Reserve, the only such reserve in Hertfordshire (by comparison, of the 224 reserves nationwide, Cumbria has 25 and London has 2). 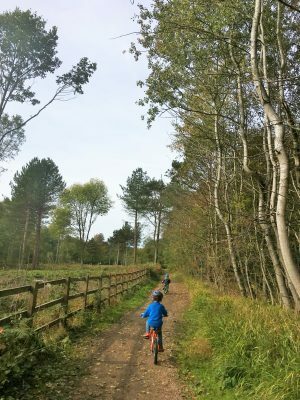 If your children are above toddling age and can handle a longer walk, or in the case of our recent visit, bike ride, there is a wide network of pathways through the nature reserve including a 17 kilometre trail. As the trails crisscross the woods, it’s easy to extend your walk or take a shortcut back to one of the two car parks. 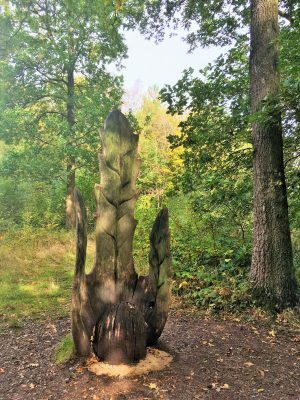 The Broxbourne Woods Sculpture Trail weaves through an interesting mix of woodland with deciduous trees such as oak and hornbeam along with evergreen sections of pine. 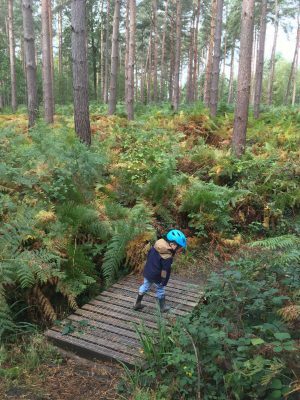 There are some excellent dens in the woods made by industrious little people and a number of ditches and bridges which should pique your children’s imaginations. The sculptures were created by Hertfordshire-born artist Daniel Cordell, whose tool of choice for carving is the chainsaw, this information went down very well with my children. 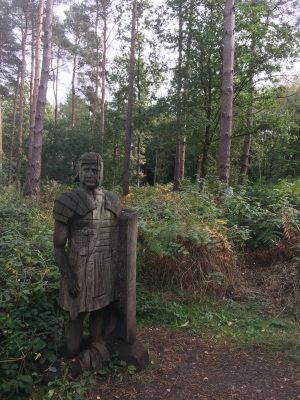 The sculptures reflect the history of the area; the Roman road from London to York passed close to Broxbourne Woods so a life-size Roman soldier can be found guarding the woods. Elsewhere a herdsman searches for his cattle as the land was originally used for grazing. 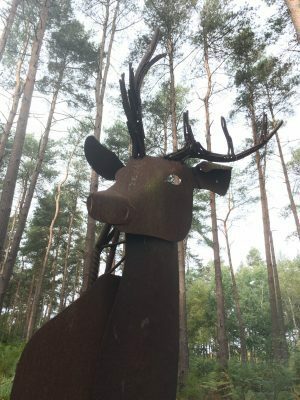 One of our favourite sculptures, unlike the rest, is made from metal: a stag made of three separate parts visible as a whole, through the trees from a bridge; but at other angles the creature’s head, torso and back legs separate. 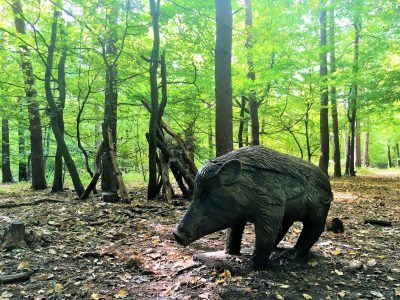 On our previous visit to Broxbourne Woods (October 2016), our boys were particularly taken by a family of carved wild boars: mother and infants. Unfortunately on our more recent visit (October 2018), the little boars had either rotted or been removed, or as we decided grown up, moved on and had a family of their own. Refreshments: As my older son had completed his 5 mile Beaver hike the night before, we decided to indulge in Sunday lunch at the Farmer’s Boy in nearby Brickendon village after our walk (portions are particularly generous so make sure you’re hungry). If you’d prefer to have a picnic, aside from the woods themselves the village green at Brickendon is a good spot and has an excellent playground which our kids loved. Parking and transport: There are two car parks, east and west. Visitors with a buggy or wheelchair are recommended to park in the east car park and take the trail anti-clockwise so that you are travelling downhill on the sloping sections. Bayford rail station (which has a direct service to London Moorgate via Finsbury Park) is just over a mile from the woods. 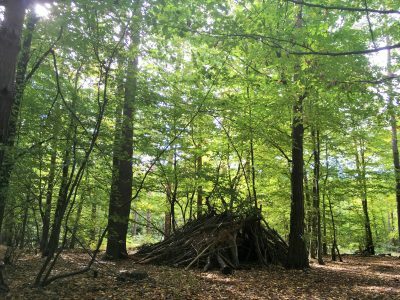 Hertfordshire County Council‘s website has further information and a good map of the woods and surrounding roads which is helpful if your sat nav isn’t sure where it’s meant to be taking you. The west car park is on Brickendon Green (that’s the name of the road), just outside the village of Brickendon while the east car park is where Brickendon Green and Pembridge Lane meet. 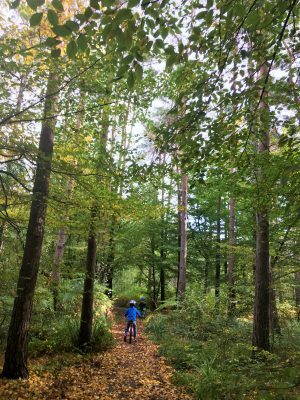 For more woodland walk ideas, check out my post on bluebell woods in Hertfordshire. And for another outdoor sculpture experience, I recommend a visit to the Henry Moore Studios and Gardens located between Ware and Bishops Stortford. 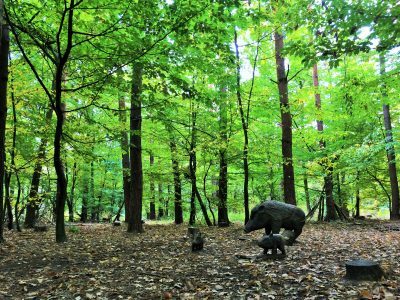 Have you visited the Broxbourne Woods Sculpture Trail or a similar sculpture trail or park? Let me know in the comments below. Am really hoping the forecast for tomorrow changes ever so slightly so we can head out again! It’s tipping it down here. Have you got the crazy gales? 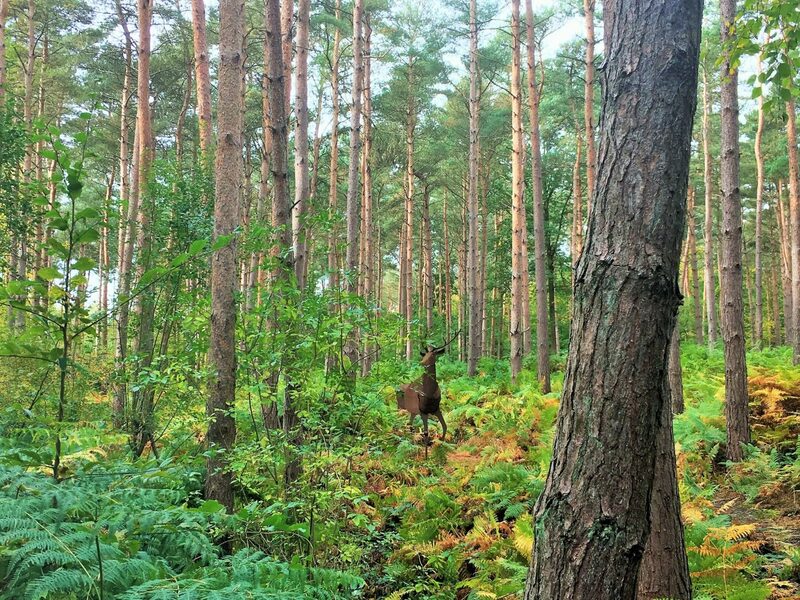 Yes, the stag is really realistic from a distance and we loved spotting the figures through the trees. Yes, the sculptures are brilliant, really good to give the kids a quick history lesson! The stag sculpture is brilliant! We visited Pendle Sculpture Trail when Rowan was younger. The theme there was the Pendle Witch Trails. Really gorgeous little walk. Looks like you had a great time too. That sounds fun too, sculpture trails are such a great way to engage little ones! Yes, it’s a great combo isn’t it? Oh I love these sculptures – what a brilliant idea!